Industrial air cooler provide an effective amazing cooling effect in almost anywhere. Industrial air coolers are also referred to as industrial swamp cooler or industrial evaporative cooler. They are used to provide large-scale powerful cooling in factories, huge indoor spaces and outdoor areas. Such systems are also used as a cost-efficient cooling solution in dry climate regions. 1. Where applicable for Industrial Cooler? Industrial coolers function by evaporating water to lower heat and moisturize the air in a process similar to natural processes. They are more eco-friendly and efficient in energy consumption than traditional air conditioners. Typically, they are also more powerful than normal outdoor fans. Among the key places they are used to cool include warehouses, manufacturing plants, workshops, construction sites and hangars. Others are gyms, loading docks, large tents, garages, farms, athletic events, barns, pool or patio areas, etc. Also known as portable air coolers, One kind of industrial evaporative air coolers. these are most applicable in commercial areas like warehouses and garages. They can also be used other outdoor areas like patios. Typical sizes go up to 13,000m3/h. These are built mostly for huge commercial or industrial settings and operate by displacing warm air to the outside. Industrial air coolers include window or wall-mounted air cooler, slide discharge cooler and down discharge cooler . Typically, their cool air supply goes up to 30,000m3/h per unit. The range of an intsalled cooler is determined by air direction, i.e. how the cooling machine faces the air outlet. (i) Window or wall-mounted evaporative coolers are capable of cooling a whole room/house or an entire garage area. (ii) Down-discharge air coolers are located on the roof and release cooled air downwards. Their air outlets descend directly into the target building and can be used to cool entire homes. (iii) Slide-discharge air coolers are normally placed on the side of a building, but also on the roof. They use an elbow to beat the wind into a current through an opening on the top and can cool entire houses. 3. 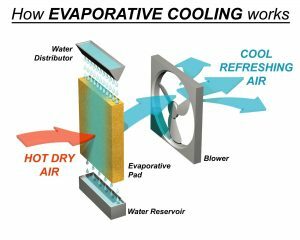 How Evaporative Cooling Work? Evaporative cooling literally means cooling using water. Remember that cooling sensation you feel on your skin as you leave a swimming pool? That is natural evaporative cooling at work. Similarly, that is how we feel the cool breeze that blows across a lake’s surface. By water being evaporated, the temperature of the air particles in contact with liquid water below reduces. This is due to an endothermic reaction that occurs. This reaction converts liquid water into a gas, thus lowering the temperature of adjacent air molecules. An evaporative cooling machine operates using this principle. It acts as a cooling fan that utilizes three key things: water, a wetted surface and a pump. The pump pulls air particles across the water, lowering their temperature. The pump is operated by a mechanical control system located within the cooler machine. The rotating fan then distributes the cooled air to the intended space. 4. 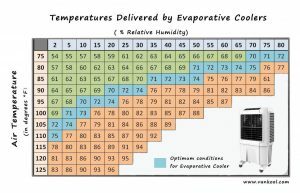 How Effective is Evaportive Cooling? 5. How much water does an industrial air cooler use? Generally, the smaller the unit, the less water it will consume. For instance, a system that is under 100 watts or 500 CFM averages less than 4 liters per hour. On the other hand, a bigger unit may use as much as 20 gallons. On a dry day, the system will use more water and provide added cooling when compared to a humid day. A drain valve allows recycled water to be drained out, and in its place, fresh water is used. Draining the recycled water from the cooler is essential as it prevents the accumulation of mineral deposits in the water that tends to cause damage and corrosion. However, you should know that a continuous drain may result in 50% more water use. When drained intermittently, additional water use can be reduced to about 10%. 6. Is an installed Industrial evaporative cooler better than AC unit? When operating a huge industrial plant, traditional air cooling methods can be expensive or ineffective at fighting extremely high temperatures. However, industrial air coolers come with fitted water tanks or hose attachments that affordably allow for recycling. Other than being cost-effective, industrial coolers produce 100% fresh air. They also don’t recirculate the same air like the air conditioner. This fresh air helps to increase productivity, promote the feeling of well-being and sustains higher and better concentration levels. An air conditioning unit is highly recommended for domestic use, small industrial rooms, and offices. Although the installation of an evaporative cooler is more expensive than an air conditioning unit, it provides a feasible cooling solution for the most industrial buildings. This helps to complement inherent openness. The cost of running this equipment is minimal due the low-pressure drop of the fan and the small pump that circulates the water. In fact, these expenses are a fraction of what it would cost to run an air conditioning based equivalent system. 7. Does the evaporative cooler pose any risks to your health? Although there have been rumors about the industrial cooler system causing legionella, there are no recorded cases to prove it. According to research, transmission of this virus is not possible through the evaporative method. The industrial evaporative air coolers only cool the air close or less than its wet bulb temperature. Hence, its water rarely rises above 20C, which is outside Legionella risk range. Additionally, the water in the cooler is not stagnant as it keeps on getting drained from the unit. 8. How to Calculate the Size of Industrial Swamp Coolers? An industrial air cooler’s cooling power is based on how much air flow it can generate. It is for this reason that these coolers are categorized by air flow. They are typically rated in cube meters per hour (CMH), cubic meters per minute (CMM) or cubic feet per minute (CFM). This calibration measures the total amount of air an air cooler can pump or move per unit time. You will buy a cooler unit with a 10,000 CMH rating. Industrial plants require various kinds of maintenance systems. These are required to keep the operation and performance of their machines and equipment at optimum. Among these key appliances and systems is a proper and efficient industrial air cooler. It’s used to make sure an industry’s overall environment remains safe and well-maintained at all times.Air cooler come with a variety of features but here are some of the important ones that can be of great benefit to you. 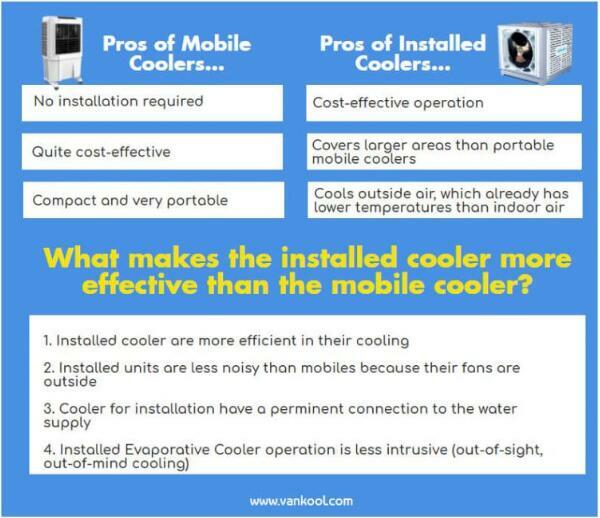 So, what factors should you consider as you look for the best industrial cooling system? Fresh material or recycled material? If used fresh material, it could be used for 10 years, while if use recycled material might have some problem after 1-2 years. The case material used should be fresh and not from recycled materials in order to guarantee long life. It should also be of the right thickness. Generally the thicker, the better. For an industrial cooler to function effectively, it needs to have the right cooling pad based on size and thickness. The thicker and bigger the cooling pad, the better the cooling performance. 100% copper wiring is best suited for a cooler in order to be effective and work well. Some manufacturers use aluminum motor wiring to be cost-effective but will end up compromising the quality of the product. Thoroughly check the airflow volume because some suppliers indicate a higher value than what is in the specification sheet. This may be misguiding and you will end up with an industrial cooler that doesn’t meet your specifications. To ensure you are not dubbed into buying a cooler that is short of your specifications, calculate yourself the air flow volume. By doing these you will be certain you have the right product. An industrial air cooler needs to be installed outside your home or premise. You can fix it in different locations, depending on the type of cooler you have chosen. • Roof-mounted: These are the most common air coolers, although they are more difficult to maintain. • Wall / Window Mounted: It is easy to carry out maintenance on a wall/ window mounted unit. They also reduce the chance of house leaks. However, it is important to note that wall/ window mounted coolers blow chilled air in the house into a central area. They are highly recommended for small homes or bigger apartments with specially installed ductwork. Industrial air coolers should be installed at least 10 feet away or 3 feet below plumbing combustion appliance vents, plumbing vents, exhaust fan vents or clothes dryer vents. Make sure to keep fuel, yard chemicals, and solvents away from the cooler. Always check the float valve after every pump cycle. This way, you will ensure that the float is not set too high, causing the reservoir of water to overflow. Provide at least 3ft of clearance on the side of the equipment that requires access for maintenance. This is a code requirement for all sides with electrical parts. To hang your coolers safely and securely, use closed-eye hooks. However, take care not to lift the open-eye hook from the chain and leave your equipment unsupported when removing the frame. An industrial air cooler needs a steady supply of clean water. Make sure to connect the water line to the system from an outdoor water source with cutoff valves. A cutoff valve is highly useful when you need to drain your system at the start of the winter season to minimize damage from harsh weather. Before powering up your cooling system, confirm that there are no leaks. Also, fill any void spaces around the cooler to prevent cooled air from escaping the system. Once you have confirmed all these parts are set, you can switch it on. If you are unfamiliar with the electrical connections, it is highly recommended that you seek the services of a certified electrician. If you are looking for a cooling system for commercial buildings or industries, opting for industrial evaporative coolers would be a great option. 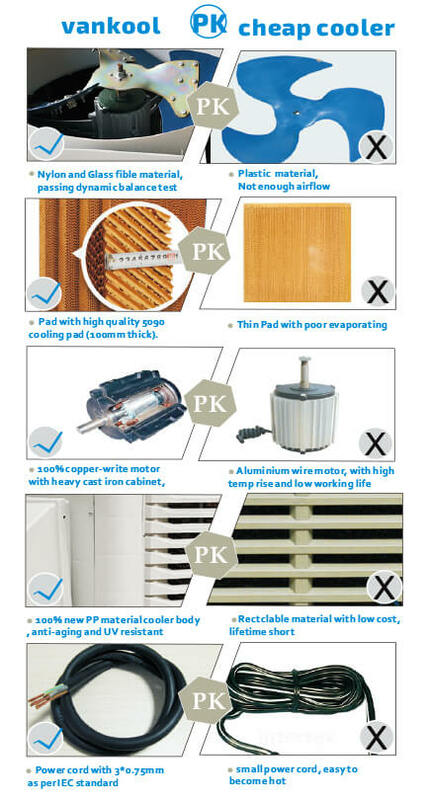 Listed below are some tips that can help maintain industrial air coolers. To ensure that the cooler does not rust, turn off the water supply connection, hose out the water pan and clean all the dirt and minerals that have settled in the cooler during the winter months. Change Cooler pads regularly Pads are pressed against the cooler. Leaving old pads that have dirt and minerals accumulated on them can cause the cooler to rust whenever rainwater flows down the cooler and runs down to the pad. To avoid rusting it always good to change pads during the fall instead of spring. Most people who fail the change the pads to save money ultimately have to spend more in the long run as they may have to change the entire cooler instead of just the pads. 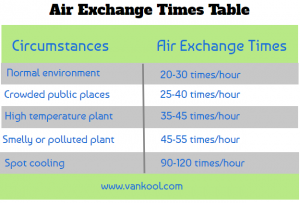 – How often should you replace the industrial evaporative air cooler pads? If your commercial air cooler is not cooling as much as it did in the past, a possible reason for this problem could be due to the particles that get caught in the pads. To solve the problem, an economical solution would be to replace the pads. However, it does not solve the problem; it is recommended to move on to more troubleshooting. The type of materials used in the pads is one of the factors that decide whether a pad need to be replaced yearly or can last for years. While cellulose pads need to be replaced less often, pads made of cheap materials such as aspen may be required to be replaced each season. Generally, pads may not be required to be changed every year. However, if the pad has lost its thickness or if the material has become frayed, it is best to get a new pad. Keep Your Cooler protected Investing in a cooler cover will help prevent outdoor air from entering your home or building. Sometimes coolers have dampers. However, if your cooler does not have one, installing a cooler cover will help increase the life of your cooler and also save you money.